This September, I’m learning new things about monarch butterflies and singing my butterfly song. I’d always thought spring was the time to sing about butterflies, but actually, butterflies such as monarchs are very much a part of life and nature in the fall, too. Thanks to one of the teachers at a school where I work, children are observing monarch caterpillars and butterflies in all the classrooms this month. Each class has a cylindrical habitat where caterpillars crawl, form a ‘J’ shape to begin their metamorphosis, hang as a bright-green chrysalis, and flutter as butterflies before their release in the outdoors. I found I had my own butterfly story to tell. After buying a bunch of flowers at the local farmers’ market, I discovered a small monarch caterpillar amid the blossoms a few days later. It didn’t move, and I figured perhaps it had expired. But a couple of days later, it was bigger and crawling along the leaves of the bouquet, munching away. I asked our teacher-expert, Valerie, what to do with my little guy. She suggested I find an aerated container, adding milkweed or butterfly weed leaves and a wet cloth in the bottom. 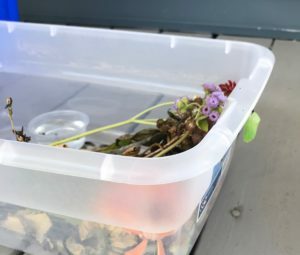 I stuck the bunch of flowers, caterpillar and all, in a makeshift plastic bin on my kitchen counter. A day later, I couldn’t find the caterpillar anywhere. Had it escaped? But after awhile, I discovered it hanging in a ‘J’ shape on the outside rim of the bin. Not long after, the chrysalis had formed. It continues to hang on the edge of the bin on my back porch. It hung on through the rain, wind and thunder when the tail-end of Hurricane Florence visited New England. I hope I get to see my very own monarch before it’s over. I didn’t realize that monarchs go through four generations during the course of one year. The final generation is the one that migrates to Mexico and the southern U.S. The butterfly in my chrysalis could end up somewhere far south! 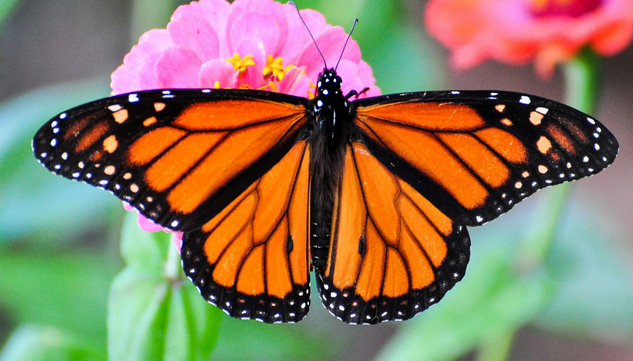 Monarch butterflies remain in danger, as numbers have been greatly reduced in recent years. The U.S. Fish and Wildlife Service is continuing to assess the status of the monarch after being petitioned to protect the species in 2014. The butterflies face danger due to loss of food supply (milkweed) owing to herbicide use, loss of forested areas and climate change. I realize that most science units focus on butterflies in the spring, but here’s my butterfly song, if you would like to sing it in the fall. This earlier post discusses teaching the song in more detail. This September, some of my students have enjoyed acting out the life cycle of a caterpillar and butterfly!